Wednesday was a chilly, grey evening in Chicago, but spirits were still high at the Alliance. 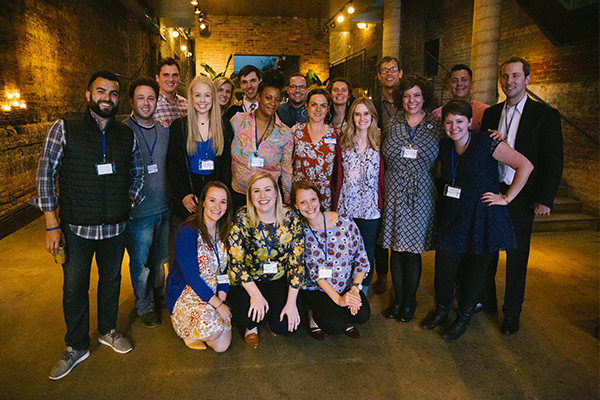 Staff, friends, and family of the Alliance for the Great Lakes Young Professional Council gathered to celebrate the recipients of their first-ever grant program! The event was held at A New Leaf, a charming brick-walled, terraced venue on Chicago’s north side, and featured music from local musician Skinny Williams. However, neither the venue nor the music were the showstoppers at this event. The grantees were the real stars of the show, who shared stories about their innovative, community-focused water projects. The Council received and reviewed 44 applications, ultimately deciding on three grantees. Each grantee received a grant of $4,000-5,000 for their project. The projects vary in scope, but all have one thing in common: a goal to make their Chicago neighborhood better through innovative clean water initiatives. Chicago Eco House seeks to use sustainability to alleviate poverty. The grant will help them develop a flower farm rainwater irrigation system for their gardens in the inner city. Ultimately, the group will have a self-sustaining garden system. Bubbly Dynamics, LLC, is a social enterprise whose mission is to create replicable models for ecologically responsible and sustainable urban industrial development. The grant will be used to design and implement graywater and stormwater reclamation techniques at The Plant, the collaborative community of small food businesses in Chicago’s Back of the Yards that is owned and operated by Bubbly Dynamics. The Social Justice Design Cooperative is a network of designers who take on public interest projects. The group will collaborate with Pilsen Environmental Rights and Reform Organization (PERRO). PERRO tackles pollution problems in Pilsen, focusing on community controlled clean water solutions. The grant will help their work to reduce lead in drinking water by distributing water filters to households with an elevated risk of lead contamination in their tap water. The Alliance and the Young Professional Council are excited to see the projects develop and are proud to be a part of these great projects. Stay tuned to learn more about how these projects develop and to learn about additional grant opportunities. This work is made possible by Alliance donors! Your donation today will help to support our outreach and clean water programs.